Stand up straight and lose pounds ! Sit up straight and lose pounds ! Its true ! You got to believe in this happy marriage of good posture / form and weight loss. Health and fitness professionals will tell you that keeping good posture will not only strengthen your core , but will also add a small calorie burn associated with the effort to maintain the posture or position. 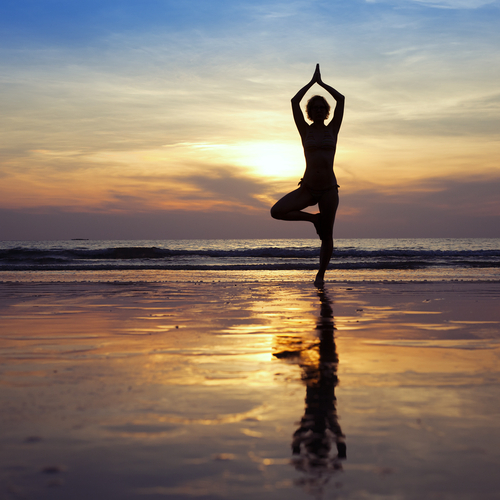 In fitness lingo , posture is most often referred to as FORM and form is what we will stick to. Lets look at form and cardio. Lets leave aside the definitions for now. Lets categorize a lil bit here. Those that love cardio exercise per se , those that know the importance of it and push themselves to do it and those that hate cardio , but yet do it because either a friend or a trainer has impressed upon them that cardio is the key to weight loss. What they havent learnt is that there is a form ( posture ) to be followed for cardio exercises just like for weight training , swimming or any other physical activity. So these are the ones that bounce , bob up and down and swing , be it indoor or outdoor ; trust me , they look like monkeys on a machine ! I feel bad to see them doing it wrong , it bothers me no end . Either the trainer has not educated them on proper form or has given up after correcting them a few times. And they have not concerned themselves to ask , question and learn either. It’s just a blind activity for them. You think I am obsessed with appearances only ? Nah. Not keeping proper form hurts. Injures the joints over a period of time , in some unfortunate cases , immediately. So why not to bounce on an elliptical , treadmill or the stationary bike ? Bouncing is letting gravity do the work for one. Is that why you are not seeing the desired results ? Fitness experts scream that heart rate is not the only indicator of how much work you are doing , but few listen. Power measurement is much better. Work out in front of a mirror and if that’s not possible , have someone watch you for proper form and correct yourself. Stay tall , be it on the treadmill , elliptical or the cycling machines. Stay tall , but no straight knees at any point , be it walking , running or cycling. Pull your shoulders back to hold yourself erect , never round them. Keep your head in line with the spine. Most of the time. A television in front of you kills form like nothing else , don’t make watching it the main activity. Danger zone : Knees , hips and ankles. You probably are raising your feet and knees too high and thereby creating a bobbing movement. Your knees , hips and ankles will hate you for being forced to absorb the impact when you bounce-walk or bounce-run. If you want your legs to keep you in good stead , you will need all the three joints – hips , knees and ankles , so don’t injure them. Next , nerve tissues can get compressed and fail to communicate with the brain. We don’t want pain , we don’t want mobility issues. Third , swinging your hips is for dancing when you move your entire body in a graceful stance and not while exercising on machines. Swinging while exercising can in fact rob you of the intended benefits of the particular workout , for it takes away the focus of the exertion that’s intended for a specific body part or muscle. Mind your stride : Practice maintaining a wide stride , placing each foot forward in front of the hip and not under it. Though the treadmill is stationary , we need to focus on creating a forward movement , as if progressing from the current spot. Strike with the ball : The secret of avoiding injuries is to land on the balls of the feet and not the heels. Striking with the heels can place a lot of stress on the ankles as you will land with a mild or a strong thud depending on your pace. So land lightly , brushing the moving belt gently coupled with knees slightly bent. All this will create a smooth movement preventing a spring back action , thereby avoiding the bouncing. Danger zone : Lower back , hips , knees and ankles. You probably are on your toes more , you are not distributing your weight on your entire feet. If feet are placed firmly with a just a slight lift at the heels , bouncing can be avoided. You probably have set the resistance too low and the ease of the movement will allow room for bouncing. Swinging hips again a no-no. Maintaining a proper upper body posture plays an important role in avoiding injuries to the lower back. Foot postioning on an elliptical is of utmost importance. Place feet firmly close to the inside rim of the pedals. Avoid placing them in the center or at the extreme right. Make sure the legs are bent slightly in order to spare your knees of any strain. Next , hold on to the bars lightly , just enough to facilitate push and pull movement – clutching on to them will hinder your pace. Make sure hands are not above shoulder level. Avoid leaning backwards at all costs. Some trainers and cardio programs will tell you to lean back while pedaling , but do not follow that. Use only the arms and shoulders for the push and pull movements , take care not to twist your upper and mid portions of your body. Finally , set a good enough resistance to make the time you spend on the elliptical worth the effort you put in. 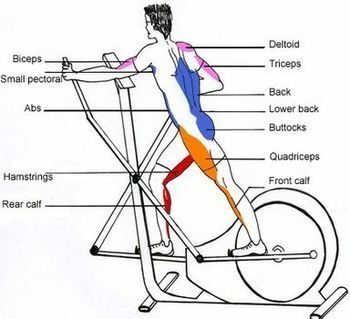 Just check out the number of muscles that benefit when you work out on an elliptical. So doing it right is like a whole body workout. It’s easy to pedal fast indoors , the mechanics of the indoor bike is such. Fixed gear systems with weighted flywheels simplify it so much that high cadences can be reached most easily compromising form in the process and as a result cyclists bounce all over the place. Unless you become a stickler for form , reaching your fitness goals will remain a dream. Indoor cycling provides some fantastic benefits , its simple and safe , provided proper form is maintained. Danger zone : Lower back , knees. 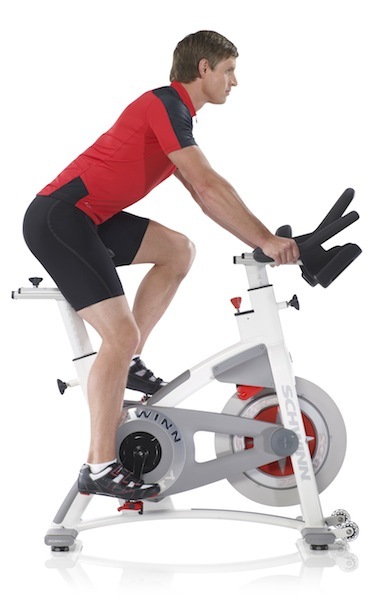 Sufficient resistance is the key to getting the best out of indoor cycling. You could pedal away as furiously as you fancy and bounce all over the saddle , if you don’t set the right resistance. Your heart rate may be high , but the fact is , you are being ridden by the bike instead of you riding the bike ! Just letting the legs spin as fast as you can is a waste of time and can put tremendous strain on your calf and quadricep muscles. On a spinning cycle indoors or regular bicycling outdoors , be assured of a back pain if you slouch and forget to tuck your tummy in. The answer to success on an indoor cycle lies in that resistance knob! And the technique ! Be in control. Seat your self with tummy tucked in and shoulders and upper back rounded just enough to reach the handl-bars comfortably , not more. Warm up with easy resistance , work it to moderate and then on , enough to challenge you. Concern yourself with the right form and the right resistance depending on your fitness level , let speed not be the guiding force. An upper limit could be 100 rpm , but that’s only for cyclists with a smooth pedal stroke or for those that have corrected their form already. For best results , shift your focus from pushing downward ( that’s a natural given , we have all done that on our tricycles ) to pulling upwards pedal stroke. Here’s to riding better ! Cycling works wonders for hips , thighs and glutes ( indoor or outdoor ) , besides working the heart. Here we go : Lead with your heels when you push down on the pedals i.e keep your feet parallel to the ground and not slanted. This way you engage the glutes. Make an effort to pull up the pedal on the upward swing if your feet are strapped. Working on the above tips ensures you give work to all muscles of the legs. Add Isolations : Increase resistance , lift yourself off the seat and slowly pedal using only the legs. Remember no bouncing , no swaying and swinging and upper body relaxed. FORM is IMPORTANT ! And finally I am tempted to insert this little ad-video to stress on FORM FOR ALL ! Wow! Super helpful information. I had never considered the impact of proper posture while doing a workout on the treadmill or elliptical machine. Thanks for the awesome post! 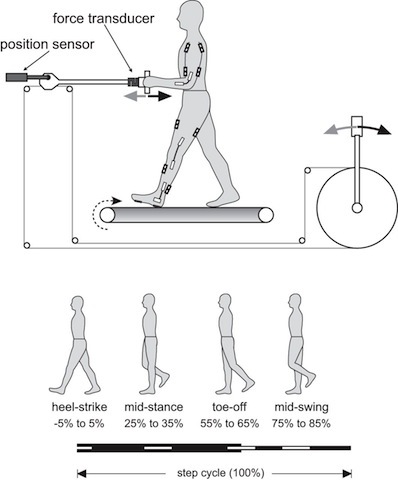 Yes Beth , not many of us are gifted with perfect gait , in fact only a handful of us are and due to that we keep stressing some part of our lower body involunatrily. Added to that is the resistance the machines offer. We only make it worse if we dont keep proper posture on the machines.